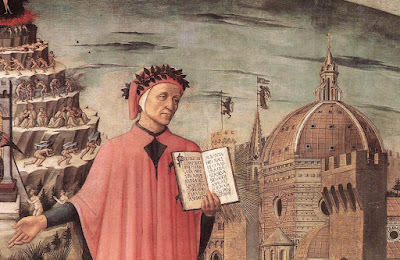 Dante Alighieri was born in Florence in 1265, the son of a small-scale financier. He was only nine years old when, according to his own account, he first set eyes on the love of his life. She was Beatrice Portinari, also nine, the daughter of a near neighbour, and she was to dominate his poetical imagination. Of course, there was never any likelihood of them marrying, because such important matters were arranged by parents, and in 1277 Dante was formally betrothed to Gemma Donati. He was not yet twelve, she was about ten. They married, probably in 1286, and had several children. Nowhere in his writings does Dante make any reference to his wife. It was Beatrice who continued to fascinate and inspire him, and in 1283, he tells us, she actually deigned to speak to him for the first time. In the meantime he studied the great Roman authors, particularly Virgil and Cicero, under the tutorship of Brunetto Latini, a man whose soul he came to place in Hell. He began his first attempts at writing poetry, particularly about his love for Beatrice. But she had married Simone de Bardi in 1287, had children, and then died prematurely in 1290. Dante never forgot her, and many years later he would portray her spotless soul guiding him through Paradise in the final section of his “Divine Comedy”. In the immediate future, her death inspired him to the compilation and publication of his first collection of sonnets about his love for her, together with his commentary upon them: a book generally known as “La Vita Nuova”; the New Life. Dante’s lifetime saw the start of a new style of painting in Florence, with Cimabue (1250-1302) and Giotto (1266-1337) foreshadowing the Renaissance. He certainly knew Giotto personally. It was also an age of great political turmoil in Italy. The great Emperor Frederick II, “Stupor Mundi”, “The wonder of the world”, who ruled Naples and Sicily as well as Germany, had faced a sentence of excommunication and deposition pronounced against him by Pope Innocent IV, and had finally died defeated in 1250. His illegitimate son Manfred managed to establish himself in southern Italy, only for Pope Clement IV to proclaim a crusade against him. The French warrior, Charles of Anjou, financed and supported by the Pope, defeated and killed Manfred at Benevento in 1266. Two years later Frederick’s 15-year-old grandson Conradin tried his luck with an expedition from Germany, but he too was defeated by Charles and then beheaded in the market-place at Naples, together with his equally young friend and supporter Frederick of Baden. This unprecedented act of violence against youths of the highest aristocracy shocked contemporaries, and fifty years later Dante was still upset by it, but the Pope rejoiced that the last of the “devil’s brood” had been extirpated. Dante, by contrast, rather admired Manfred, and placed his soul in Purgatory rather than Hell. This was not the end of disturbances in Sicily, because at Easter 1282 the people of Palermo suddenly rose up and massacred Charles’s French troops in the city, in a carnage that quickly spread throughout the island. (One of the many explanations of the mysterious word “Mafia” is that it is short for “Death to the French!”) King Peter of Aragon then claimed the throne of Sicily by virtue of his marriage to Manfred’s daughter, and the Pope, Martin IV, responded by excommunicating him and proclaiming a crusade against him. Such blatant abuse of spiritual weapons for purely political ends did much to discredit the papacy. The troubles of the papacy had, in fact, barely begun. Following the death of Nicholas IV in 1292 there was a hiatus of two years while the cardinals wrangled over the succession. Eventually they settled on a compromise candidate: an 80-year-old Italian hermit called Peter Morrone, who duly became Celestine V. Not surprisingly, this aged unworldly man proved to be a disastrous choice, and after a few months he was persuaded to abdicate, was imprisoned and died soon after. Inevitably, there were rumours that he had been murdered. Dante showed his contempt for Celestine by consigning him to the “Vestibule” just inside the gates of Hell: a region reserved for those who lack the courage to be either virtuous or wicked, and who are endlessly buffeted about by powerful winds and stung by wasps. The next Pope was Boniface VIII, the scion of a powerful Roman clan. He had exalted opinions of the authority of the papacy, which soon involved him in a disastrous dispute with King Philip IV of France. The culmination came in 1303 when Philip’s minister, Nogaret, kidnapped the Pope and actually struck him in the face. Boniface was soon rescued by his supporters, but he was a broken man and died not long afterwards. After the brief papacy of Benedict XI, a Frenchman was elected Pope, as Clement V. But he took up residence in Avignon and never set foot in Rome. For the next seventy years, all the Popes were French, living at Avignon, and little more than puppets of the Kings of France. This then was the situation for the latter stages of Dante’s life. It is not surprising that he consigned Boniface VIII to one of the lowest circles of Hell, as we shall see. All this left Italy, and especially Florence, divided into two rival parties; the Guelphs (supporters of the Pope) and the Ghibellines (supporters of the Emperor), and local feuding was very bitter. The Ghibelline families were driven out of Florence in 1266 and all their properties destroyed, thereby leaving an open space which is now the Piazza della Signoria; it being solemnly decreed that no building should ever be erected on such an accursed spot. It was against this background that Dante began his public life. He joined the Apothecaries’ Guild, fought for his city at the battle of Campaldino against Ghibelline forces in 1289, and began to make a name for himself in Florentine politics. He emerged as a fine orator, and in 1300 was elected one of the three Priors of the city, made a superintendent in charge of the roads and road repairs, and sent on a mission to Rome. But Florentine city politics was always riddled with factions, and the Guelph party soon found itself divided into rival groups known as the “Blacks” and the “Whites”; a split which seems to have been more about family rivalries than any ideological disputes. Dante’s sympathies were with the Whites. He was still in Rome in November 1302 when Florence was occupied by the troops of Charles of Valois, brother of Philip IV of France. The Black faction seized power and the Whites were driven out. Early next year Dante was charged in his absence with embezzlement of public funds and sentenced to death by burning at the stake. The death sentence was renewed in 1315, and even extended to include his three sons. Dante never set foot in his home city again. The rest of his life was spent in a wandering existence round the cities of northern Italy, supported by various powerful families but never staying anywhere for more than a few years. In his work “De Monarchia”, published in 1308, he expressed his longing for a strong leader who could provide unity for Italy and for the whole of Christendom. He had hopes that first Charles Martel, grandson of Charles of Anjou, and then the Holy Roman Emperor Henry of Luxembourg might fulfil this role, but both died young with nothing achieved. Around 1308 he began work on his masterpiece, known as the “Divine Comedy”. It is set in Easter 1300, and describes in three books how he, guided by Roman poet Virgil, is taken firstly down through Hell, then up Mount Purgatory on the far side of the earth, and finally through the spheres of the planets and stars in Paradise. He takes the opportunity to bring many of his contemporaries into the story, especially in the first book, the “Inferno”, where he descends ever deeper inside the earth. Pope Celestine V, as was mentioned, is amongst other cowardly souls in the Vestibule. The Florentine Ghibelline leader, Farinata degli Uberti, is discovered alongside the Emperor Frederick II in the burning tombs of the heretics. Dante’s old tutor Brunetto Latini is placed among the sodomites; a fact which has puzzled scholars ever since, because Dante was always appreciative of the debt he owed to Brunetto’s teaching. Pope Boniface VIII was, of course, still alive when the story was supposed to be set, but Dante still manages to get a dig at him. In one of the lowest circles of Hell the poets meet the shade of Nicholas III, a notoriously corrupt Pope, who mistakes Dante for one of his successors and asks, “Are you here already, Boniface?” Finally they encounter the gigantic form of Satan himself, at the earth’s centre, like a maggot in the heart of an apple. Satan eternally chews on the bodies of Judas Iscariot, Brutus and Cassius. This last scene always comes as a shock to modern readers, brought up on Shakespeare and accustomed to see Brutus as a heroic, patriotic figure, “the noblest Roman of them all”; but to Dante, who believed universal empire was God’s will for the world, the crime of Brutus and Cassius in killing Julius Caesar was almost as wicked as that of Judas in betraying Christ. The poets now pass right through the earth and reach Mount Purgatory on the far side (thus making it clear that Dante, as with all his educated contemporaries, knew that the world was round). Purgatory houses the souls of those who repented of their sins and who, after being purged of evil, will eventually be permitted to enter Paradise. (In later centuries, Luther, Calvin and other Protestant theologians denounced the whole notion of Purgatory) As mentioned above, at the entrance to the mountain he meets King Manfred, who is having to do penance for thirty times his natural life because he delayed repentance until just before his death in battle. Virgil conducts Dante to the summit of the mountain, but as a pagan he can go no further, and it is the shade of Beatrice who then guides the poet through the circles of Paradise, which are marked by the moon, the sun and the five visible planets, meeting saints and choruses of angels, until finally, beyond the stars, Dante is granted a sight of God himself. This vision of the structure of the heavens was ultimately derived from Aristotle. Dante completed this third section of his great work around 1320, when he was living in Ravenna. The next year, returning to the city from a diplomatic mission to Venice, he caught malaria and died, aged 56. His sepulchre can be seen in Ravenna. In the 16th century Michelangelo was keen to build a tomb for him in Florence, but the Franciscan monks of Ravenna refused to release his bones, and even went to the lengths of hiding them to prevent a handover. They were not rediscovered until the nineteenth century. Dante is revered as one of the greatest poets of all time, but also as the originator of the modern Italian language.